The trees listed below are available in minimum quantities of 4 of each type. Tubestocks is propagated in specially designed root pruning tubes 125mm deep by 50mm square. 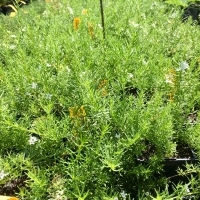 The stock is sun-hardened and ready to be planted out or grown-on. 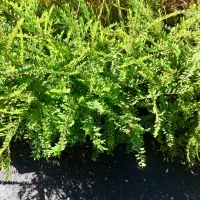 An clumping perennial with green, strappy foliage. Deep green and red Kangaroo Paw flowers in Spring. 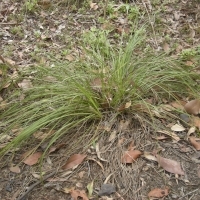 Plant in well drained soil in a sunny position. 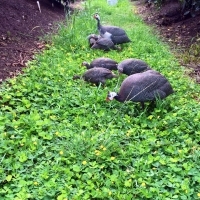 Feed with slow release fertilizer in Spring and Autumn. Some watering during dry periods will keep the plant looking it's best. 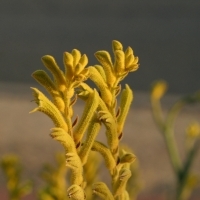 Everlasting Mega Gold™ Anigozanthos is a mid-sized, longer lived Kangaroo Paw that gets far less black spot in comparison to short lived Kangaroo Paws. 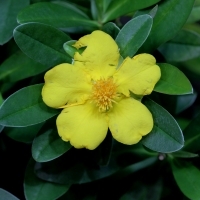 It has large gold flowers all year round, except in colder climates where it won’t flower in the winter months. Tolerant of frost and drought. Perfect for gardens, borders, mass plantings and pots. The flowers also look great when used in cut flower arrangements. Few drought resistant shrubs can rival the color of 'Burgundy Queen.' Everything about it is majestic and burgundy. Its fully double flowers are intense dark burgundy and profuse, and the fine foliage of this large shrub is also burgundy flushed. 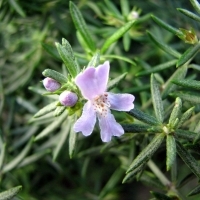 It originates from New Zealand where it grows in a wide range of areas from peaty bogs to coastal and mountain regions. It is surprisingly adaptable, especially to arid sites and soils. 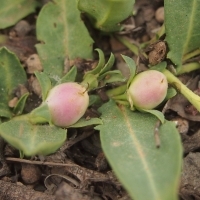 A small slender shrub of the pea family, the Austral indigo bears attractive mauve flowers in winter and spring. The flowers are and excellent source of pollen and nectar for many native insects and it is the host plant for the Tailed pea-blue and Common Grass-blue butterflies. Tip pruning will improve the appearance and encourage a bushy form. 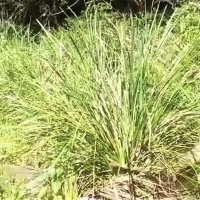 Indigenous Australians used the crushed leaves or roots to kill or stun fish and eels. 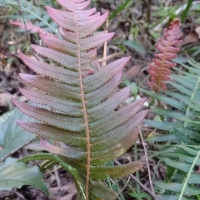 This fern is found growing in a variety of habitats such as rainforest margins, eucalypt forests and rainforests. It is well adapted to both sunny and shaded areas. 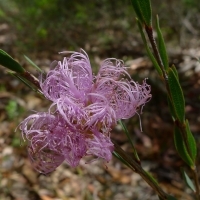 Its new growth is bright orange-pink and is a stunning understory plant. 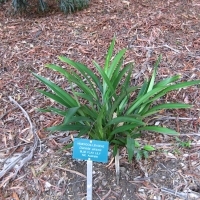 The fern is usually easy to grow in gardens, containers and baskets. 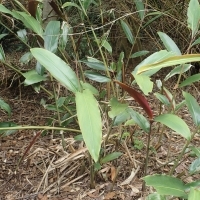 Having a spreading growth habit makes D. aspera suitable as a groundcover. 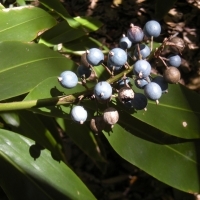 It grows best in shady conditions and in acidic soil, with high organic composition. A stunning perenial plant with beautiful bird attracting flowers. 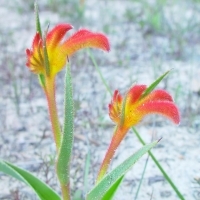 They feature grass like foliage with brightly coloured flowers that resemble a Kangaroo paw. Anigozanthus will tolerate drought and coastal conditions. They can also survive a light frost. 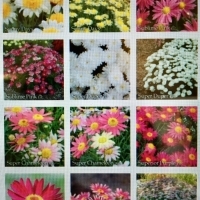 Used in mass plantings, borders, feature plants and for cut flowers. Prune back after flowering to promote new growth. 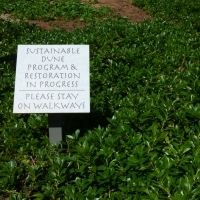 Moderate watering required during dry season. Anigozanthus can be affected by 'ink disease' a fungus which can cause black marks on foliage. One of the best grevilleas to grow as it flowers from April to August and it is an important source of food for birds in the winter months. 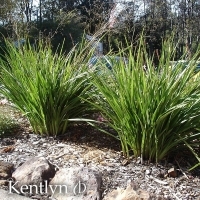 New foliage is brown and its silver rusty foliage is very attractive year round. Prune it annually to keep it bushy and prevent wind damage. 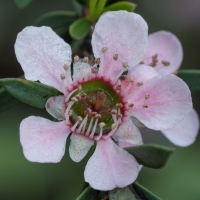 Grows 2-5 m high and 2-4 m wide, frost hardy once established. 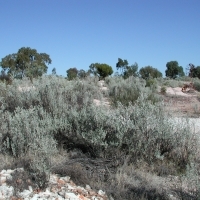 Originates from Queensland - Burra Range, Barcaldine, & the Great Dividing Range. This is a small tree with striking bronze backed leaves. 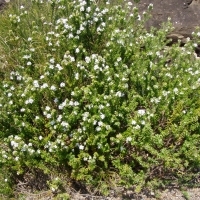 It has white flowers in spring and early summer. The attractive foliage and flowers make this an excellent garden specimen. Grows 5m high and 2-3 m wide. 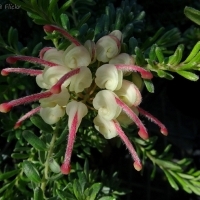 A lovely scented grevillea with loose long stems which hang, displaying creamy white honey and cinnamon scented flowers. This is a tough bush which needs a good pruning annually pruning back one third of the new growth. 1.5 m high and 2m wide. Attractive foliage and bird attracting. Originates from South Western WA. This gorgeous grevillea flowers throughout the year. Its prickly nature adds to its beauty as the little birds like to hide or nest in the bush. Beautiful delicate pink flowers adorn the shrub. Tip prune once a year. This grevillea is best grafted at .5m high to make easy access for pruning. Originates from Mt Churchman in WA. 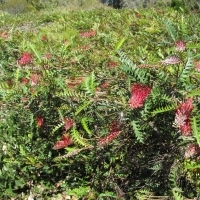 This is a hybrid of Grevillea longistyla, it is a very popular grevillea as it withstands most climates. 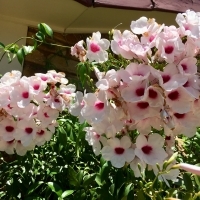 Its has beautiful flowers which attract birds for many months of the year. 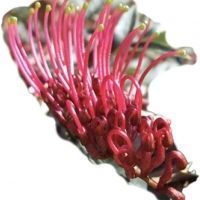 Grevillea Elegance is a small tree, 4-5 m high with a spread of 3m. 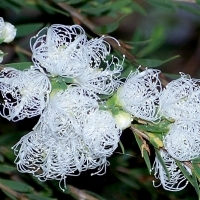 Its has light delicate foliage which will not shade out other plants in the garden. 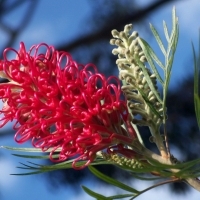 This beautiful grevillea will flower all year round. It is wonderful as a hedge and prunes very well. This is a low bush suitable for any garden. Prune lightly once a year. Highly attractive to small birds. Grows 1.5m high by 1.5m wide. Originates from Mt Lesueur WA. 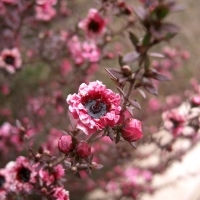 A beautiful loosely growing small shrub 1.5m to 2m. Flowers appear most of the year with the heaviest flowering in summer. Tip prune in late winter. Rare but easily grown. Originates from Port Gregory in WA. This is quite a hardy grevillea which has a magnificient show of scented creamy white flowers in the spring and spot flowers throughout the growing season. It adapts well to most areas in Australia. 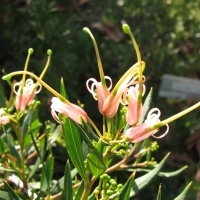 Grevillea curviloba is best grafted as it tends to be quite weak on its own roots. Tip prune after flowering flush in the Spring or Autumn. 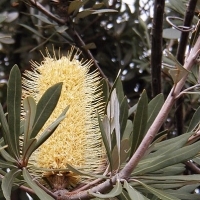 It grows well as a standard grafted onto Grevillea robusta. 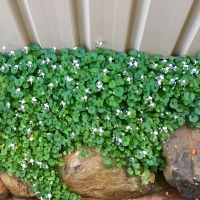 It grows 1m high and 3m wide. Originates from Muchea WA. 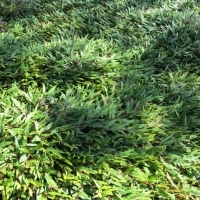 Low mounding or prostrate spreading ground cover. It is a hardy and versatile garden plant. 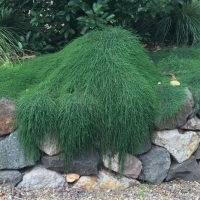 It can be used as a dense cascade to flow over walls and embankments or as a feature in a rockery. The flowers are upright lemon brushes that appear from summer through to winter. 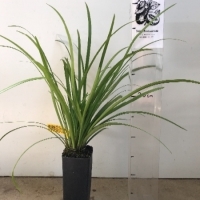 grows 60 cm -1 m high and 1.5 - 2m wide. Requires a well drained, sunny position. 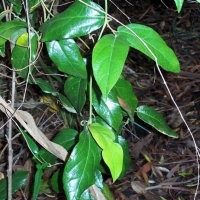 A dense mounded shrub with small leaves. The flowers are delicately curled and very attractive, to people, birds and insects.The small leaf makes it useful as a low growing hedge. Great for shrubberies or in a pot. Frost and drought tolerant. This plant can be neglected and will still keep growing, but with some extra attention will be a great garden performer. Clusters of deep-red flowers up to 40 mm long occur on stems to 1.5 - 2 meters in height. Flowering occurs over a long period from late spring to mid summer. 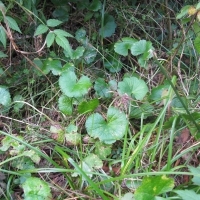 A clumping plant with leaves 60cm long. 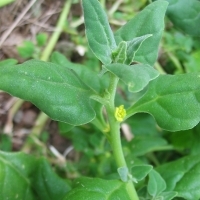 The flower height will vary depending on site conditions. 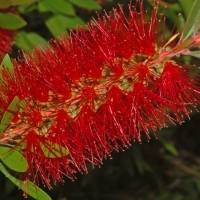 Big Red is drought tolerant but will flower best in moist well drained soils. 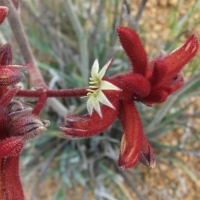 Big Red is a long-lived variety and is one of the hardiest varieties of kangaroo paws. Vibrant orange flowers make this an attracting native to grow in mass plantings. 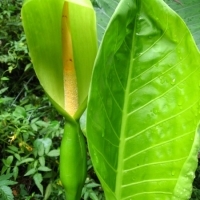 A tough plant, with great garden performance. The flowers are highly attractive to birds. 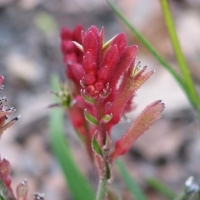 A good kangaroo paw for landscaping, as it is disease resistant and reasonably hardy. Likes a sunny spot in well drained soils. Cut back the dead flower stems to keep the plant neat. 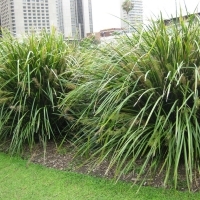 Compact grassy and evergreen with bright, yellow, furry flowers on 1m stems, in spring and summer. Nectar rich blooms will attract native wildlife to your garden.